A few images from last Wednesday's visit to Ashwood Nurseries: a grey day except for a shaft of sunlight right at the end, illuminating the H. niger seen above. Many thanks to John Massey for the personal tour! Helleborus foetidus with Cornus 'Magic Flame' in John Massey's garden. Horticultural heaven: the Ashwood hellebore breeding house. Wine-red anemone centre: a new selection for breeding. Speckled slate: I like the neat shape and size of this. Elizabeth Banks, President of the Royal Horticultural Society, toasts the launch of the new list of Award of Garden Merit plants with (L-R) Kylie Balmain, JMG, Richard Sanford & Jim Gardiner. 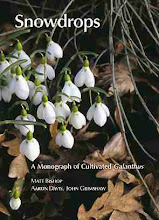 Although not much has been said of it in this diary, for the past 15 months or so a great deal of my time has been devoted to the 2012 review of the Award of Garden Merit (AGM) for the Royal Horticultural Society. The AGM is the recognition given by the RHS to plants of outstanding quality for garden use and is perhaps the highest accolade a plant can receive - it is thus a source of pride to the raiser and of potential value to the nursery trade. 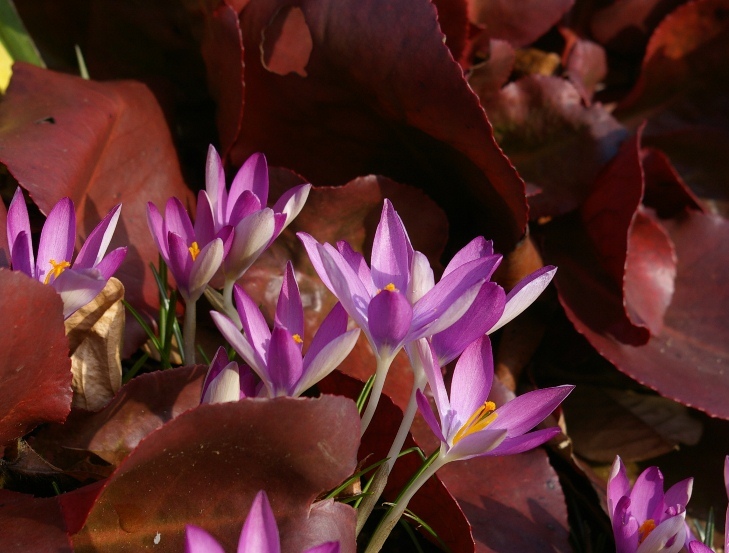 It's fair to say that AGM plants form - or should form - the core of any garden planting. The Award of Garden Merit was revitalised in 1993, with the idea that it should be reviewed every ten years - so 2012 was scheduled for a major review. 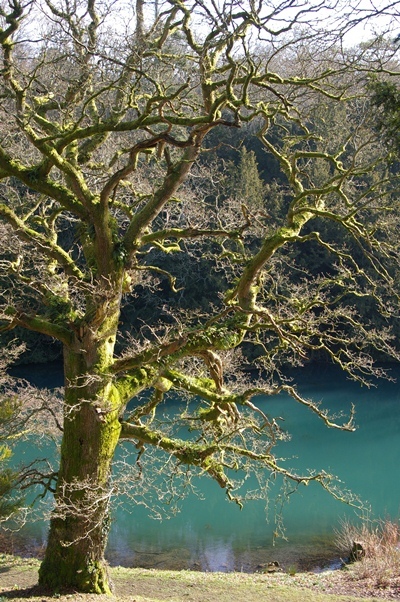 Having attended several preparatory meetings I was invited to undertake the task of co-ordinating the review across all plant groups and their appropriate committees, and was also asked to lead the team working on woody plants. With all the changes in my life that occurred last year this was quite a challenge, but somehow we managed to get the review completed for almost every group of plants in time for a new AGM list to be published and launched last Tuesday: the lists for Hosta and Hemerocallis were finalised the previous Thursday. The lists, broken into various categories, are available on the RHS website, here, and with them will be found the new RHS Hardiness Ratings chart. Both are important tools for British gardeners at least. 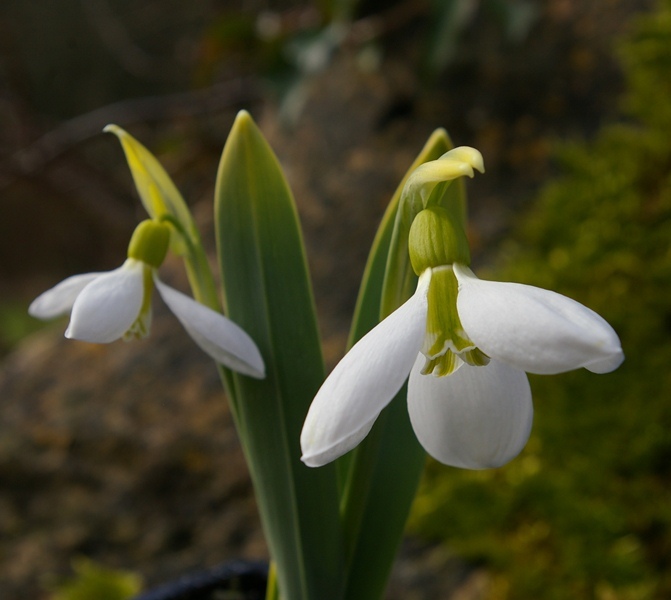 Galanthus elwesii 'Comet' is a worthy new addition to the AGM list. There are about 7100 AGM plants in the new list. Having lost 1900 and gained 1400 it is slightly shorter than before, but we have removed a lot of plants that are not available in the trade and are thus debarred from holding the AGM. As I said in my speech at the launch, many people are interested in the 'ins' and 'outs', but in fact what is most interesting is the consistency of the core of AGM plants - in most cases a good plant twenty years ago is still a good plant today. An article on the process has appeared in The Garden (February 2012) and a more detailed version will be in the next issue of The Plantsman. The dream team: Peter Catt, Maurice Foster, Chris Lane, Chris Sanders and Roy Lancaster, debating Hydrangea for the AGM review. To bring this list together has entailed a huge amount of work from a large number of people on the RHS plant committtees, who have trawled through lists and debated each candidate's merits. For me this was a fascinating process and I'll always remember the meetings of the panel discussing shrubs, meeting in the Tower Room at Wisley for four long sessions and watching the diseased leaves of Robinia pseudoacacia 'Frisia' blow away, taking its AGM with them. Sitting with the 'dream team' of experts assembled was an incredible education and very pleasurable too. Such work was carried out by members of all seven plant committees - I hope all will be proud when they see the AGM logo decorating the label of a plant in a garden centre or nursery. An awful lot of work went on behind the scenes too, most especially by Richard Sanford of the Informatics team at Wisley, who meticulously logged every decision and hardiness rating into the RHS database, an enormous task, taken to the wire with the last changes going in late on Friday afternoon. The display of AGM plants put together from Wisley, at the show on Tuesday last week. 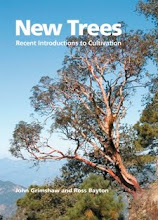 To get to the launch at the RHS show last Tuesday was therefore a huge relief to all concerned. Kylie Balmain, Head of Horticultural Relations, and a team from Wisley had spent the weekend putting together a display of AGM plants, which attracted a lot of attention, and some of us were interviewed for a podcast - though I've yet to find it on the RHS website. The launch itself was fun, once the speeches were over, with ample wine and lots of good gardeners to talk to: a very pleasant end to a long journey. The launch party on Tuesday: Jim Jermyn is excited about something in front. Matt Pottage and Razvan Chisu, in varying degrees of hirsuteness. Hellebores and snowdrops were looking great in all the gardens visited; a white seedling with Galanthus 'S. Arnott' at Colesbourne Park. I got back last night after a wonderful though intensive five days of seeing friends and visiting gardens, enjoying the richness of plants that enliven late winter as well as the first decent, warmish sunny days of the year. This is a selection of images from the trip. My 'winter bling' bed at Colesbourne Park, looking good in its second winter. Yucca 'Color Guard' is outstanding for winter colour and texture. The foliage of emerging herbaceous plants is an overlooked component of the winter garden: Corydalis temulifolia 'Chocolate Stars', at Colesbourne. 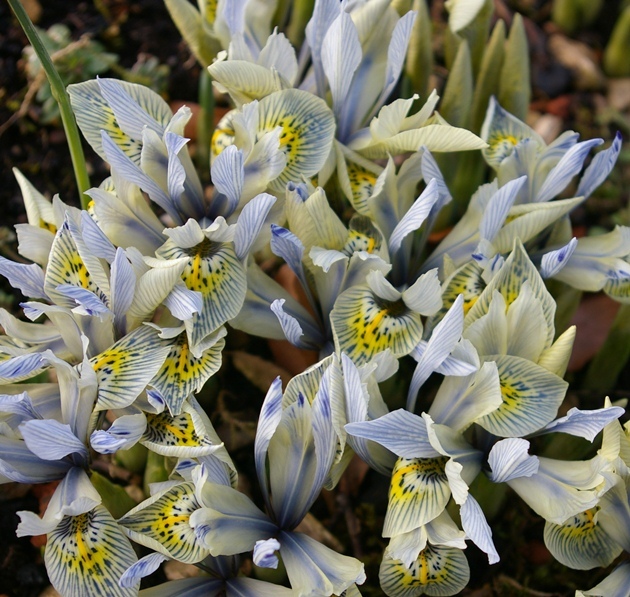 Another example: Iris foliage in an Oxfordshire garden. The garden of friends in Northamptonshire - for security reasons I am being coy about locations - a tapestry of colour and interest. Not a great picture, but this is one of the most exciting new snowdrops I've seen for ages: albino with a yellow ovary. It is called 'Yellow Angel'. A richly coloured Ficaria verna seedling. Rumex sanguineus and Cyclamen hederifolium at my parents'. Another gold medal-winning display from Avon Bulbs at the RHS show on Tuesday. The dark plant in the centre is Lunaria annua 'Chedglow' - must get some seed of that! A display of Cymbidium by McBean's. A plant of the green one, 'Scotch Mist', accompanied me home. Very inconvenient on the tube. An unusually coloured selection of Hepatica japonica in John Massey's collection. A double green hellebore in John's garden: more on Ashwood hellebores in another post. 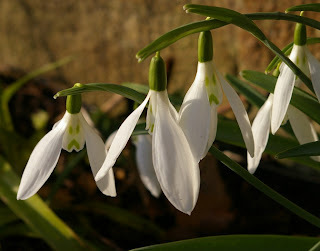 Koen Van Poucke's selection of Galanthus reginae-olgae subsp. 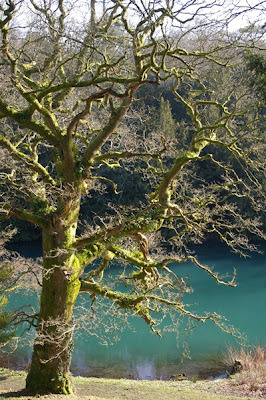 vernalis, 'Amigo'. Nice flowers and very attractive 'striped' leaves. Snowdrop sales at Arboretum Kalmthout: the rush had passed by the time I got there and only cheap things were left. The weekend in Belgium gave me a chance to meet up with a number of galanthophilic friends and acquaintances and get a brief view of snowdrop-growing there. The snowdrop day at Arboretum Kalmthout provided the opportunity and was very enjoyable: it's amusing how such events are similar throughout the world. I missed the start of the sale, but I imagine that Belgian elbows are as sharp as those in England or Ireland! 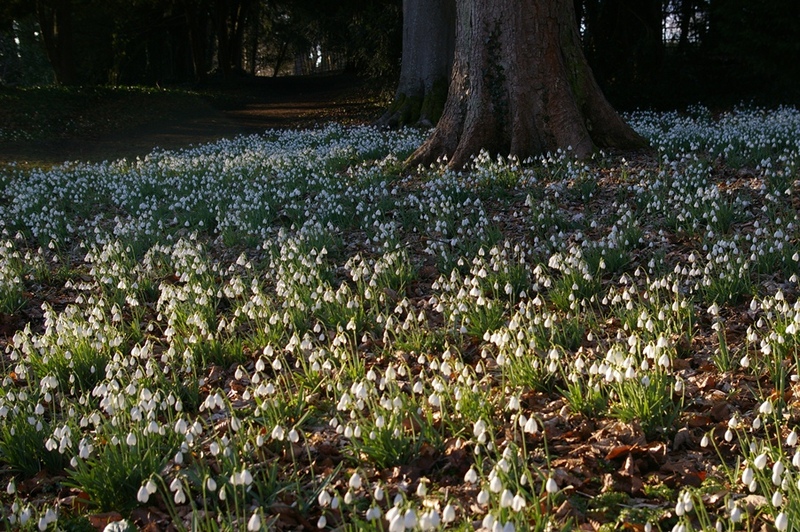 In addition to the sale and the lectures, there was an indoors display of imaginatively presented snowdrops that was quite charming. Original 'snowdrop hedgehogs' by Wedgewood c. 1800. Unfortunately the 'Flore Pleno' flowers have aborted in these. Single plants displayed between mirrors: very effective. Dioramas of snowdrops (and other plants) displayed in cabinets with a lens-like glass window. 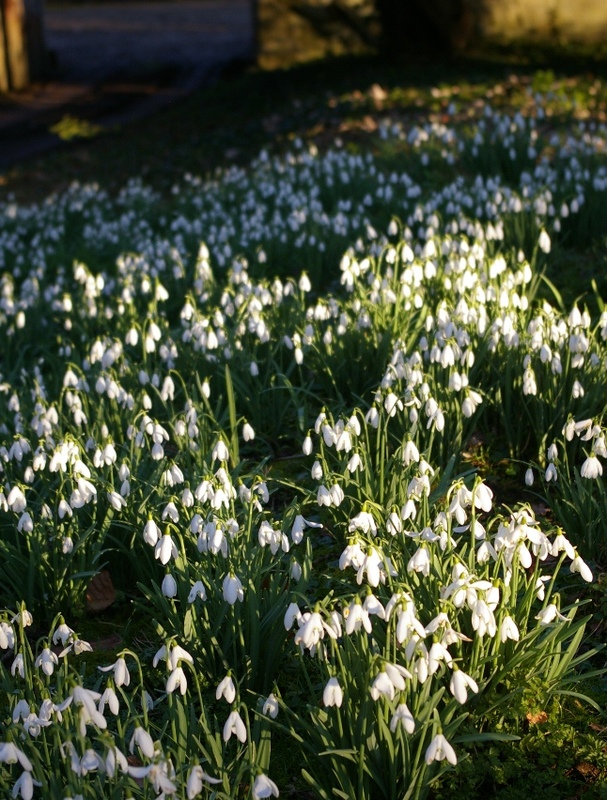 Snowdrop photographers brave the elements at Arboretum Kalmthout. A green-tipped G. nivalis in a naturalized population near Antwerp where 'Scharlockii' has hybridized with 'normal' G. nivalis: this clone has slightly enlarged spathes. A freaky G. nivalis with a double pedicel, and extra appendages... several such variants are known from the low countries. 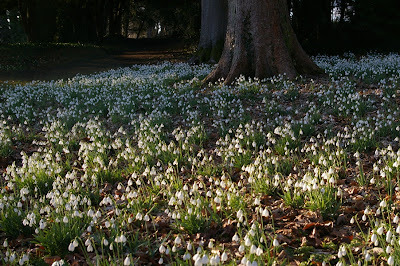 On Sunday I was taken under the wing of my friends Johan Mens and Valentin Wijnen to see some local snowdrop sites and gardens, and had a lovely time. It was rather cold (but dry) and many of the 'drops were not very advanced, but it was an interesting opportunity to see some of the selections that have been made there in recent years. Valentin Wijnen's selection, G. nivalis 'Grakes Gold' which has distintively yellowish leaves. G. nivalis 'Flore Pleno' naturalized at the castle of Alden-Biesen. The oldest snowdrop cultivar, G. nivalis 'Flore Pleno', still of outstanding merit for its effectiveness in the garden - and its robust tolerance.